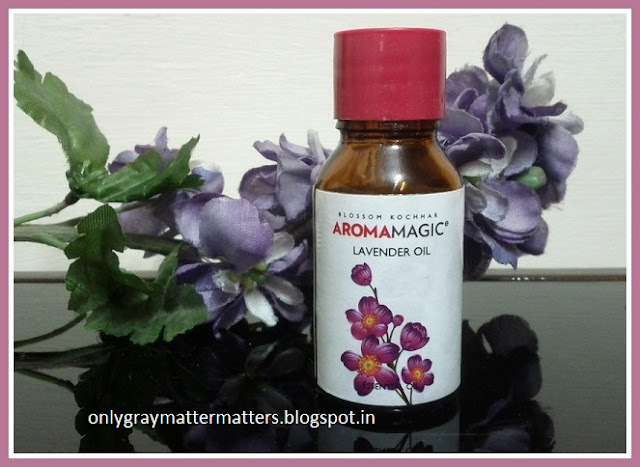 This is a review of Aroma Magic Lavender Oil. I had been yearning to own some essential oils for years but did not know where to procure good quality essential oils. I came across a whole range while browsing through medplusbeauty.com last year and ended up buying this lavender oil immediately. Had heard so much about its amazing multipurpose uses, I wanted to include one in my personal care. It is a great essential oil to keep at home in all seasons. It smells a little different and much stronger than the artificial lavender perfume you may have smelt in other products. There are two types of oils (that I know of) in Aromatherapy: Essential Oils and Carrier Oils. The word 'Essential' comes from 'essence', meaning an oil that possesses the essence or scent/aroma of the plant from which it is extracted. Essential oils evaporate easily and should be stored properly. They need to be diluted before applying it to the body. Essential oils are diluted by mixing them with Carrier Oils (oils that carry them into the skin). Severe Headache: I usually avoid medicines. So if ever my head is throbbing, medicine is the last resort. In case of severe headache, I mix a few drops of this lavender oil in pure coconut oil and massage into my head and it provides instant relief. Actually it increases blood circulation in the massaged area. Insect Bites and Stings: Our place has a lot of green around and numerous varieties of insects usually roam around especially in Summers and Rainy season. My brother was stung by a wasp and it usually swells really bad. I applied 2 drops of Aroma Magic Lavender Oil on the bite and it did not swell at all. He was fine by evening. Skin Infections: I am very very prone to skin infections ranging from mild rashes to eruptions on the skin as I have very sensitive skin. It is quite a pain to deal with. But applying lavender oil on the itchy/infected skin always gives instant relief. My sister in law developed a rash on her neck and applying body lotion with a few drops of lavender oil mixed in it helped cure it by next morning. Colds: When suffering from bad cold, taking steam with 2-3 drops of lavender oil added to the water is very soothing. Please do NOT use essential oils directly as they may burn the skin. Dilute in a carrier oil like jojoba/olive/coconut/sweet almond/ castor or you can even use your cooking oil. For use on the body, you can even add a few drops to your body lotion and apply. If you have a bath tub in your bathroom, add a few drops to warm water and soak in it. Will be a relaxing spa-like experience. Get your tired feet relaxed by soaking them in warm water with a few drops of Aroma Magic or any other good quality lavender oil added in it. In case of body-ache or Muscle Pain, mix with essential oil and massage into the body. It improves blood circulation and relieves pain due to its anti-inflammatory properties. It is said dropping a couple of drops of lavender oil on your pillow helps you relax at night and induces good sleep. I tried that but even 2 drops were too strong and kept burning in my breath. Moreover, the aroma remains in your pillow forever. So I would rather suggest using in an electrical or reed diffuser in your bedroom. Electrical, ceramic or reed diffusers are available online and offline in the home and living section of lifestyle stores/ shopping malls. Electric ones work just like you plug in liquid mosquito repellants at night. You add the oil/ diluted oil in the bottle and plug it in. The heat generated by electricity evaporates the oil and spreads the relaxing aroma into the room. 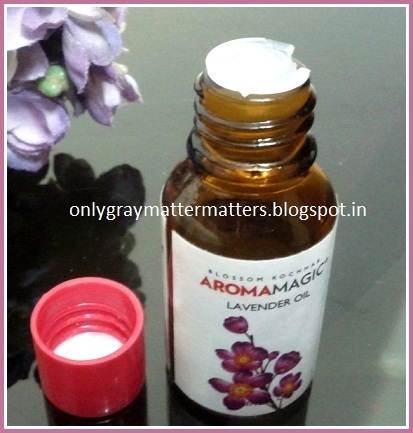 Use Aroma Magic Lavender Oil to ward off skin infections during monsoon. Dilute in coconut / olive or sweet almond oil and rub in between toes, inner side of elbows, back of knees to prevent or treat fungal skin infections during monsoon. Mix a couple of drops to your shampoo. Mix on your palm and rub into roots. Helps treat scalp infections. Else add to your hair oil right before applying the oil. I had read besides being antiseptic, antibacterial and anti-fungal, lavender oil is anti-viral too. So I even tried it on a wart like lump on my arm. But it did not help at all. I did not find it to be antiviral. Overall I am happy with the basic day to day uses I have mentioned above. 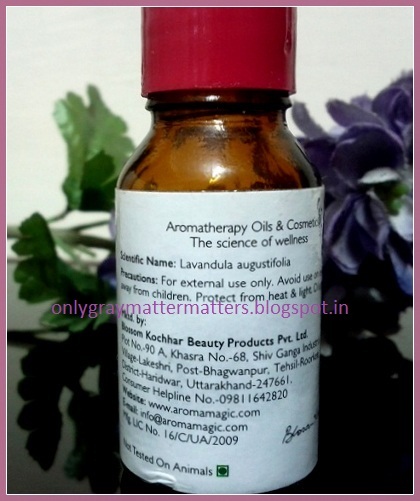 This oil is very very strong so do not add a lot or else it may burn the skin. 1-2 drops go a long way. Do not mix it in another oil and store. Essential oils should always be diluted only at the time of use. Do not use for massage on very small children (less than 3 years). Essential oils should also be used carefully in teenagers as they may cause hormonal changes. But adding a couple drops in their bathing water, hair oil or diffusing it in their room is totally safe. Already comes in a dark brown glass bottle to prevent photo sensitivity. Still store in a cool place away from direct sunlight. A very very small percentage of people may be allergic to it. If you feel any such symptoms, either you are using more than required quantity or you are allergic. Easily available on many online stores and offline in shops/pharmacies that sell essential oils. You can also try the lavender oil from Soulflower. Their packing is much better. great post..i didnt know Lavender oil had so many uses!! :) which means the article was helpful to you and I am glad! Glad you liked it Supriya :) Yes, in case of essential oils, it is imperative to know how much is too much. I will try one of these they are available in so many variants na. Wow, that's nice Megha. Thanks for sharing. I haven't tried the bath soak yet but was thinking of trying in a foot soak as sometimes my feet feel very tired. When compared to Aroma Magic and Soulflower which one is better or they are both the same. You have mentione packing is better in SF but I see Aroma magic oil is muc cheaper than that of soul flower.. Any difference in the quality and effects? Dear Sia, this Aroma Magic Lavender oil I have is good and I am satisfied with the quality. But the bottle is very thin and lighter in shade than the Soulflower ones. Essential oils should be in very dark brown bottles to prevent contact with direct Sunlight and also to prevent evaporation. Also, the dart broke off very soon as you see in the last pic. Apart from that, no complaints. Yes, even I feel that the Soulflower one is costlier because almost all their essential oils fall in the Rs 350 range. But if I am buying many products and also using a discount coupon, it won't be that costly. Apart from the discount. you get Rs 4 credited as Soulflower points for each Rs 100 you spend, which means another 4% of the sale is returned to you immediately. Besides they sometimes send surprise gifts too on high value orders. I know Aroma Magic just as a brand but Soulflower treats its customers like Kings and Queens, so that experience is priceless.